The Roosevelt Lake water level remains at 65 percent full. It has been at this level for several weeks due to the increased monsoon rains throughout the watershed. The flows into the lake from the Salt River and Tonto Creek have decreased recently so more moisture is going to be needed to maintain this level. As a point of reference, during the first week of August during the past two years, Roosevelt Lake stood at 40-42 percent full. The Salt River flow is just under the normal flow at 200 CFPS and the Tonto Creek is above its normal flow at 18 CFPS. Typically, during August, the Tonto Creek is not flowing. The water clarity is improving steadily with the lower flows and is now clear everywhere except the ends of the lake where the water is entering. The water temperature is in the low to mid 80s and each week the temperature is slightly dropping. Reaction baits such as jerkbaits and crankbaits continue to produce excellent numbers of bass in the 12- to 14-inch range. Anglers report fishing main lake points in 15-25 foot depths however, some bass are being caught in water as shallow as 4 foot. Dropshot and Texas rig techniques were also reported successful in depths of 25 foot. 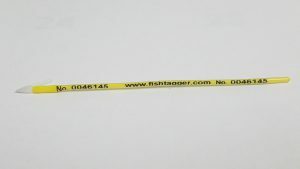 Translucent colored soft plastic baits have been reported successful on bight sunny days. Anglers are also reporting excellent night time fishing conditions. During the recent full moon phase, top-water baits such as a Rio Rico and a Spro Frog produced lots of action just after sunset. Dark colored jigs and crawdads fished on a Texas rig also brought good numbers of fish to the boat. Crappie fishing continues to be poor on Roosevelt Lake with typical reports of five crapping being caught after several hours of fishing. 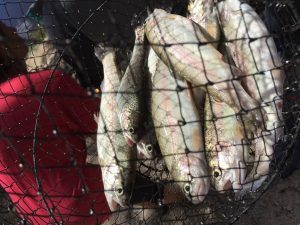 Several crappie anglers have given up on Roosevelt and Apache for crappie and are fishing San Carlos Lake on the Reservation near Globe. Anglers are reporting catching limits of crappie on San Carlos; however, many are small and less than a pound. Two anglers recently reported catching over 50 crappie but keeping only 15 of the largest ones. LAKE PLEASANT – (Lake elevation 1,669 feet, 64 % full). Surface water temperature have been around 85 in the river and 87 degrees in the main lake. The lake level has dropped 3 feet during the past week. Many reports indicate striped bass fishing is great anywhere from 40- to 70 feet of water. Many anglers had great luck fishing at night during the recent full moon. This waxing gibbous moon will become a new moon Aug. 21, when using submersible lights at night will become extremely effective. 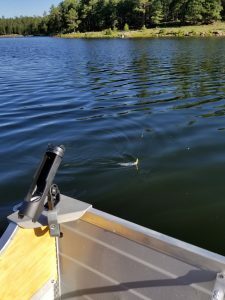 Previously, on Aug. 5, Scooter Griffiths from The Arizona Fishing Guides said the lake had been hit or miss with stripers but the largemouth bass bite is still consistent with a dropshot or Senko-type bait in the deep trees. BARTLETT LAKE – Lake elevation is 1,793 feet, feet, 93 % full. Water temperature has been up to 88 degrees. The lake level has dropped a foot during the past week. Our water quality monitoring 2 weeks ago showed there was no oxygen below 26 feet deep. Scooter Griffith from The Arizona Fishing Guides said Wednesday, Aug. 2 that the lake has been great for high numbers of largemouth bass with crankbaits and some top-water lures during the morning and slow-moving baits as the sun gets high such as Texas-rigged brush hogs and crawdad imitations. Brent O.: A few largemouth bass were caught in 10- to 20 feet of water near ledges. Weighted hook, 1/16-1/8 ounce, with a Senko or Dinger was the bait of choice. Fish were mostly around the 2-pound range with one over 3 pounds (5+lb’er 4 weeks ago). The lake looked like it was down about 1 foot. I caught a flathead catfish (pic above) weighing just less than 21 lbs while searching for largemouths on a YUM Dinger near a cliff ledge — what a ride that was! Fishing definitely seemed to be improving overall compared to the last few weeks. 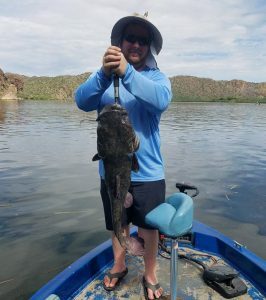 Scooter Griffith from The Arizona Fishing Guides reported Wednesday, Aug. 2 that bass fishing has been good with most fish comes via a dropshot rig in 10-15 feet of water. He’s been seeing a few fish chasing bait early in the morning when the water is moving. Anglers can catch them on jerkbaits and top-water lures. HORSESHOE LAKE – Lake elevation is 1,972 feet (10-percent full). The lake has risen 12 feet during the past week. When the lake is full, there are a lot of spawning fish. No new reports. LOWER SALT RIVER – On Thursday afternoon, the river was flowing at 715 cfs out of Stewart Mountain. Shane S.: Caught several little rainbows early morning 7-8 a.m. trolling Mepps chartreuse/bright orange colors about 2 mph east side of lake. Trolling action died down immediately after that so I switched to drift fishing slightly off the bottom with small weighted treble hook and corn (yellow) PowerBait. Got tired of catching the little rainbows and decided to try for tiger trout so I trolled again back toward the ramp. The west side of the lake seemed quiet for boat anglers. Trolling black rooster tail 40 yards west of boat ramp and dock area and landed a tiger trout. Then dropped in PowerBait and caught three more tigers. Several spit the hook at the boat because I was not using a net. 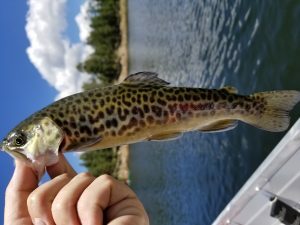 The tiger trout fight harder but they are also on the small side. Bottom line: yellow PowerBait on a size 14 treble, weighted, on 4-pound test or lighter is almost always successful for me in this lake. This outing proved no different. Shore anglers were having some moderate success on northeast and southeast shores from what I could tell. A lot of people and kids congregating around the boat ramp made it difficult to retrieve my boat. The lake is pretty muddy from all of the runoff in the recent weeks. Folks using PowerBait on the bottom are still catching some trout. With the monsoons taking a break, the fishing for trout slowed way down this week. Folks fishing the upper end of the lake were catching bluegill and crappie on flies and crappie jigs. Stocked with channel catfish. Our hatchery has begun stocking small trout into Cataract Lake. These fish average about 7-8 inches. Cataract has done a good job of growing trout in the past so we are hoping these fish will have nice sizes by fall. No new report. I have heard that folks are still catching trout off of the rocks on the opposite side of the lake from the boat ramp. I would try power bait fished off of the bottom. My coworker fished Lower Lake Mary yesterday from 10 -2 and caught 20 nice rainbow trout on a silver and blue Kastmaster cast out to the middle and reeled in just fast enough not to get in the weeds. We sampled Kinnikinick Monday to look at growth of fish. 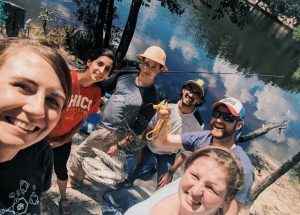 We caught brown trout, tiger trout and rainbow trout in our nets. The brown trout were feeding on crayfish and minnows. We caught fish near the weedbeds on both sides of the boat ramp. We also caught two brown trout in a net set on the bottom in 20 feet of water. I would try fishing small crayfish imitating crankbaits or small spoons to catch brown trout. Another possible way to fish is to catch some grasshoppers around the lake and fish them on the surface in the evenings. Very few fish can resist a big fat grasshopper kicking around on the surface of a lake or stream. This is also the time of year when catfishing can be good on Kinnikinick. Lake level is declining slowly. 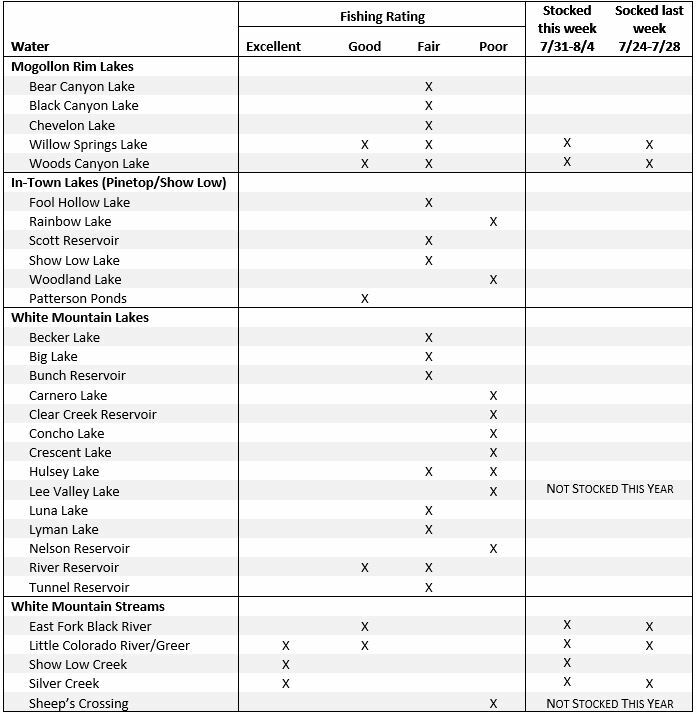 It would be great if the lake stayed at or above the current level forever, but there are some advantages of declining water in the late summer and fall. First, the flotsam that rushed downstream with the huge runoff will be stranded on shore, making boating much safer. Next, clean sandy beaches will be increasingly available for shore camping and daily visits to the lake. See the full Aug. 9 report from Wayne Gustaveson (www.wayneswords.com). 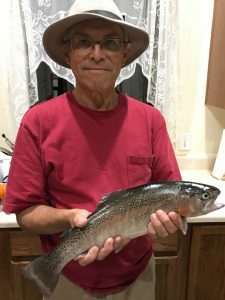 Mike C.: Whole mess o’ fish at Rose Canyon last Saturday (Aug. 6). Great rainbow trout action in the morning with PowerBait (green, rainbow, orange) and longer 18-inch leaders. A group of us landed about 20 in a few hours worth of work. You’ll catch a few keepers amongst the host of stockers if you stay at it. Get there early!